I made this cake for Matilda’s birthday! Its a savory cake containing smoked salmon and other goodies. She didn’t eat it, but she enjoyed helping me decorate it. Make stacks of 5 slices of bread and trim off crusts. Ideally, all of the bread will be the same size. Put 3 slices of bread in a row. Put some mayo on the bread. Put a layer of smoked salmon and then top with honey mustard. Add a layer of bread with some mayo. Add a layer of sliced/mashed boiled egg and capers. Add another layer of bread slices with mayo. Put mayo on both slides of the next layer (to protect bread from cucumber moisture). Add another layer of smoked salmon and honey mustard. Top off with final layer of bread. Get an electric mixer and mix and equal quantity of sour cream and cream cheese. Beat till smooth. “Ice” the “cake” with the “frosting”. 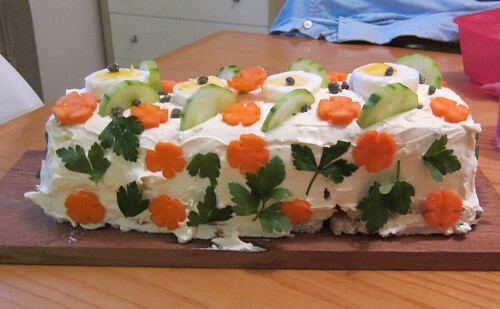 Decorate with capers, carrots, cucumbers, eggs cut into shapes. You can also use radish, boiled shrimp, more smoked salmon. Be creative! You crack me up, “She didn’t eat it, but she enjoyed helping me decorate it.” Looks lovely!